Linguist, critic, poet, psychologist, I. A. Richards (1893-1979) was one of the great polymaths of the twentieth century. He is best known, however, as one of the founders of modern literary critical theory. Richards revolutionized criticism by turning away from biographical and historical readings as well as from the aesthetic impressionism. Seeking a more exacting approach, he analyzed literary texts as syntactical structures that could be broken down into smaller interacting verbal units of meaning. 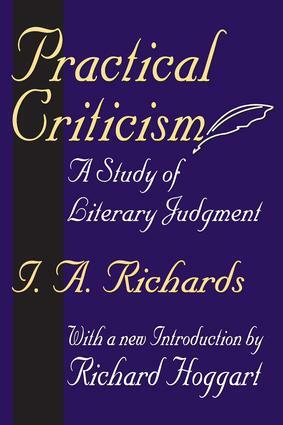 Practical Criticism, fi rst published in 1929, is a landmark volume in demonstrating this method.